Kerry Gallagher is a Digital Learning Specialist at St. John’s Prep in Danvers, Massachusetts. She is also Director of K-12 Education for ConnectSafely, a non-profit based in Silicon Valley focused on helping children, parents and educators use connected technology in safe and innovative ways. Kerry is an EdSurge columnist and her own award-winning blog, Start With a Question, can be found at www.KerryHawk02.com. 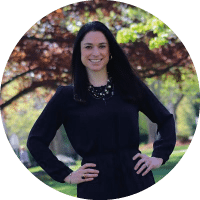 With 15 years of experience in public and private education, she has been recognized as an ASCD Emerging Leader, Future Ready Thought Leader, TEDx Speaker, PBS Digital Innovator, and MassCUE Pathfinder. Kerry serves on the Massachusetts ASCD Board. Find her on social media @KerryHawk02. I started as a middle and high school teacher in the early 2000s and was one of the first to pilot Palm Pilots (remember those?) in the classroom as a way to provide options for introverted students to communicate their learning more effectively. I immediately saw the potential and saw my students’ engagement increase. That’s where it all began. Since then I have worked as both a classroom teacher and a professional coach to help teachers and students develop more creative learning experiences. Right now I’m passionate about the potential of blended learning coupled with effective digital citizenship. When we teach students about their rights and responsibilities as users of connected technology (digital citizenship), and then help them utilize that technology in the classroom to perform creative academic tasks (blended learning)… that combination is equipping them with the skills they need to create, consume, and communicate in the careers of the future. There is no limit to how far they will go. Brianna Hodges: She and I hold similar positions in completely different parts of the country. We have similar drive and goals when it comes to inspiring teachers to take risks and get creative with their teaching. I so appreciate having conversations with her via FaceTime to refresh and refocus. Her blog is awesome, too. Kyle Pace: Kyle has been an influencer for a long time, and for good reason. He is a voice of reason when other edtechies can get carried away with a new trend, and yet his insights are positive and refreshing. I admire his desire to learn and grow constantly even though he is already considered an expert in the field. Simon Sinek: His Golden Circle TED Talk was pointed out to me by an administrator a while ago when that administrator visited my classroom and saw how I taught. He actually said that my lesson plans captured that concept! Now that I’ve read up more on Sinek’s work, I reference it all the time when I run professional learning for teachers. It is the way all of us should strive to learn. Angela Duckworth and Carol Dweck: The combined work of these two researchers has really influenced the way I think about my own professional growth and how I want my students to feel about learning. Duckworth’s Grit helps clarify the importance of both struggle and critical thinking in the learning process. Dweck’s Growth Mindset helped me better understand how important it is to constantly self-evaluate. All of us can continually improve if we are seeking out feedback and reflecting on our strengths and areas for growth. FlipGrid: It is new, it is a Student Data Privacy Pledge signatory (an edtech dream), and teachers and students alike love using it. The level of interaction, engagement, and communication it brings to learning is exciting. I’m looking forward to seeing this tool grow. Pear Deck: I love how teachers can take a traditional lecture and turn it into an interactive experience for students using this tool. It help students stay on task, provides teachers with lots of data on their students’ progress, and integrates smoothly with any device. First and foremost, I process a lot of my work and my own professional learning by blogging. If a company wants me to write about the area of education they focus on or the way their tools is helping learners and teachers, I’m always interested in pursuing that. I particularly like working with brands to pilot their product and then give feedback. For instance, the grade 6 teachers and students recently worked with Google’s Be Internet Awesome team to pilot their Interland game and the accompanying digital citizenship curriculum. The engagement with the developers was a rewarding learning experience for our students. Our teachers appreciated the feedback loop as well and have adopted the curriculum with this year’s new grade 6 class. Often these collaborations lead to conference presentations or blog posts, but the ongoing investment in the relationship is primary. But the easiest way, of course, is to reach out to me via Twitter. I’m @KerryHawk02.